For the first time since 2007 the Bruins are getting ready for round two action. 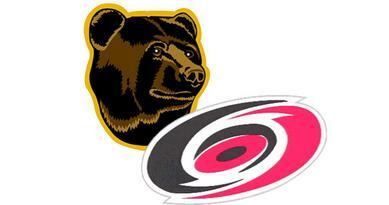 The Carolina Hurricances present the next hurdle in the Bruins quest for their first NEFHL Cup. Devin Setogucchi and Tomas Vokoun lead the way against the Canes who came out on top in a hard fought seven game series with the Slugs of Buffalo. Bryan Murray will stick with the same lineup that eliminated the Mighty Maple Leafs in game 5 with Slava Kozlov on the shelf for at least another game. "Kozlov is still day to day and we will evaluate him tomorrow, he won't be ready for tonight for sure" said Murray after the Bruins optional morning skate. Funny thing about that 'optional' skate is that not one member of the Bruins opted out, even V-Kunt stayed for the entire practice taking shots right up until the zamboni came on the ice. "We are so focused and in the zone, we didn't work hard all year to win the division or win one round, we are trying to win the Cup and won't rest until we make it there" said V-Kunt with beads of sweat rolling down his forehead. The Canes boast one of the most decorated goalies in Martin Brodeur, they have a young aggressive team lead by Ville Leino and Loui Eriksson. On the backend they rely on a lunchpail core who take orders from veterans Mattias Ohlund and Mathieu Schneider. Right now they have the hottest PP but one of the worst PK, they don't give up alot of shots due mainly to their excellent two way play, much of which left the Slugs gasping for air in round one. The gameplan for the Bruins is an up tempo forecheck with strong backchecking, Murray is famous for the employment of the 3,2,1 pyramid system that so many teams have tried to emulate, and the bruins will rely on their goalie as much as they have become acustom to. As in the matchup with the Leafs the Bruins hope to at least split the first two at home and take their league best road record into Carolina to try and stun the Canes like they stunned the Leafs.